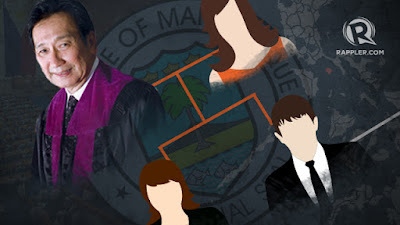 Lord Allan Velasco Marinduque-Politics Supreme Court Justice's Family Building a Political Dynasty? Supreme Court Justice's Family Building a Political Dynasty? If they win, this will make Velasco the only sitting Supreme Court justice who belongs to a political family. It all began in 2010 when Lord Allan won a seat in Congress. He was the first family member to foray into politics. Three years later, his mother, Lorna, joined Congress, representing the party-list group MATA. It was then that the seeds of a Velasco political dynasty started to be planted. Unfortunately for Lord Allan, he lost to Representative Regina Ongsiako Reyes in 2013 but lodged a protest with the Commission on Elections on the ground that Reyes was a naturalized American when she ran. Lord Allan asked the House of Representatives Electoral Tribunal, which his father heads, to disqualify Reyes. The case eventually reached the Supreme Court. Velasco inhibited himself in both bodies. In the end, Lord Allan won, but only after years of battling it out. He took his oath of office February 1 and will serve only 5 months as congressman or until end of June 2016 when the current Congress ends its term. It is unclear what links Lorna, a nurse, and her daughter, Tricia, a lawyer, have with the supposed constituents of MATA, or if they have advocated causes on behalf of those with impaired vision. In its Facebook page, MATA says that it will work to promote eye care for all Filipinos. Its last post was in May 2013 when it won a seat in Congress. This time, Lorna is moving out of MATA to run in a local race, giving way to her daughter. When Lorna was in Congress, Tricia was her chief of staff. She was also part of a law firm which described Tricia’s specialty as “developing intellectual property strategies.” Before this, she was judicial staff head of her father in the Supreme Court. In August 2018, Justice Velasco will retire from the Supreme Court. Will he, too, join the political fray?